Open: Fri 22, Sat 23, Sun 24, Fri 29, Sat 30, Sun 31 May 12-6pm or by appointment. Open: Fri 12, Sat 13, Sun 14, Fri 19, Sat 20, Sun 21 June 12-6pm or by appointment. Open: Fri 3, Sat 4, Sun 5, Fri 10, Sat 11, Sun 12 July 12-6pm or by appointment. This series of three exhibitions of sculptural installations has been curated by artist and lecturer Denise Bryan. 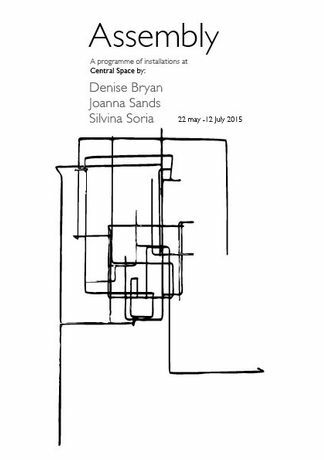 It is an opportunity to bring together works made by three London based artists, Denise Bryan, Joanna Sands and Silvina Soria. internationally. Soria studied sculpture in Buenos Aires and now lives and works in London, her work has been exhibited widely both in Argentina and Europe. their ideas. Each installation has been created as a site-specific work, the first two exhibitions in the series are pieces that are being given a second life in the Central Space; the third installation has been created specifically for the Central Space. Der Spiegelsaal, 19 Princelet and Rooting, each ask questions about how sculpture relates to the architecture in which it is placed and how site-specific installations can be transformed when they are recreated in alternative spaces. Please note that each artists has different timing and Private Views.